Who pulled off the denim on denim look better? 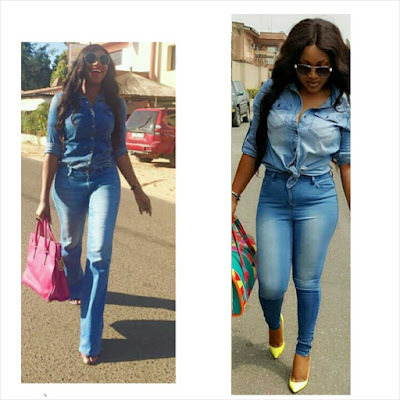 Ebube Nwagbo or Mercy Aigbe? I'm a bootleg junkie so its Ebube for me. BEAUTIFUL9JADELTABABE.. exuberant wore t better loops anyway me am Justsayingmaownohh via ma LATEST TECNO F7. Mercy!! Kindly follow us for all kinds of human hair, pure brazilian, malaysian, peruvian, Mongolian, BB pin- 2BB4FDAF, Instagram- @hairbyglowyqueen ,, you can whatsap us on 07067499533 or call 08054997426,, We also do FREE delivery to all parts of Nigeria!! !